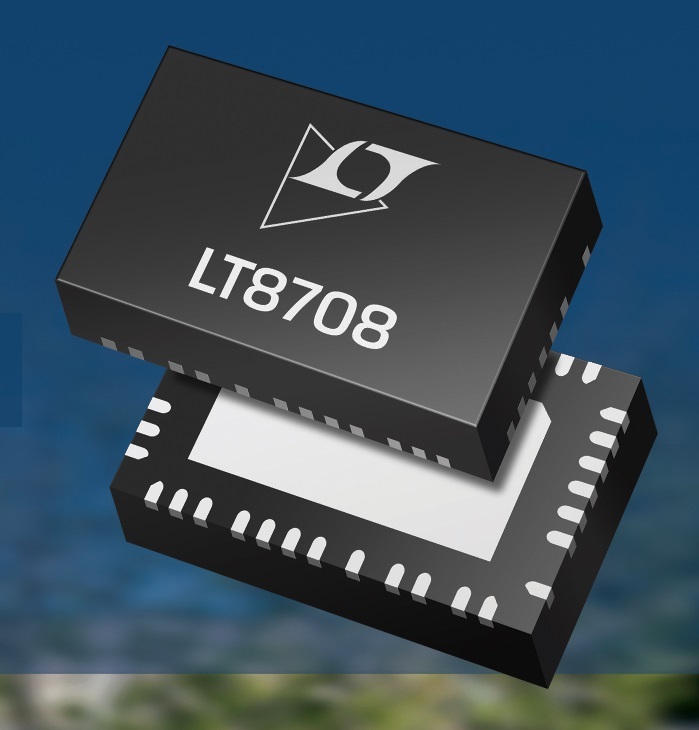 Analog Devices has announced the Power by Linear LT8708/-1, a 98% efficient bidirectional buck-boost switching regulator controller that operates between two batteries that have the same voltage. This makes them well-suited for redundancy in self-driving cars. The LT8708/-1 operates from an input voltage that can be above, below or equal to the output voltage, making it well suited for two each 12 V, 24 V or 48 V batteries commonly found in electric and hybrid vehicles. It operates between two batteries and prevents system shutdown should one of the batteries fail. The LT8708/-1 can also be used in 48V/12V and 48V/24V dual battery systems. The LT8708/-1 operates with a single inductor over a 2.8 V to 80 V input voltage range and can produce an output voltage from 1.3 V to 80 V, delivering up to several kilowatts of power depending on the choice of external components and number of phases. It simplifies bidirectional power conversion in battery/capacitor backup systems that need regulation of VOUT, VIN, and/or IOUT, IIN, both in the forward or reverse direction. This device’s six independent forms of regulation allow it to be used in numerous applications. The LT8708-1 is used in parallel with the LT8708 to add power and phases. The LT8708-1 always operates as a slave to the master LT8708, can be clocked out-of-phase and has the capability to deliver as much power as the master. One or more slaves can be connected to a single master, proportionally increasing power and current capability of the system. Another application is for an input voltage to power a load, where this same input voltage is used to power a LT8708/-1 circuit that charges a battery or bank of supercapacitors. When the input voltage goes away, the load maintains power without disruption from the battery or supercaps by way of the LT8708’s bidirectional capability. Forward and reverse current can be monitored and limited for the input and output sides of the converter. All four current limits (forward input, reverse input, forward output and reverse output) can be set independently using four resistors. In combination with the DIR (direction) pin, the chip can be configured to process power from VIN to VOUT or from VOUT to VIN ideal for automotive, solar, telecom and battery-powered systems. The LT8708 is available in a 5 mm × 8 mm QFN-40 package. Three temperature grades are available, with operation from –40 to 125°C for the extended and industrial grades and a high temp automotive range of –40°C to 150°C. Pricing for the LT8708/-1 starts at $6.60 (1,000s). NXP Semiconductors has announced a new family of high-performance safe microprocessors to control vehicle dynamics in next-generation electric and autonomous vehicles. The new NXP S32S microprocessors will manage the systems that accelerate, brake and steer vehicles safely, whether under the direct control of a driver or an autonomous vehicle’s control. 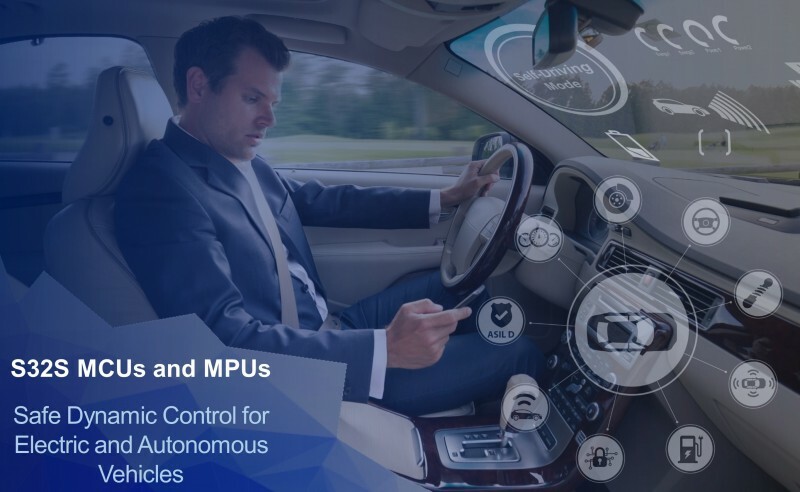 NXP is addressing the needs of carmakers developing future autonomous and hybrid electric vehicles with newly available 800 MHz MCU/MPUs. The first of the new S32 product lines, the S32S microprocessor offers the highest performance ASIL D capability available today, according to NXP. The NXP S32S processors use an array of the new Arm Cortex-R52 cores, which integrate the highest level of safety features of any Arm processor. The array offers four fully independent ASIL D capable processing paths to support parallel safe computing. In addition, the S32S architecture supports a new “fail availability” capability allowing the device to continue to operate after detecting and isolating a failure—a critical capability for future autonomous applications. NXP has partnered with OpenSynergy to develop a fully featured, real-time hypervisor supporting the NXP S32S products. OpenSynergy’s COQOS Micro SDK is one of the first hypervisor platforms that takes advantage of the Arm Cortex-R52’s special hardware features. It enables the integration of multiple real-time operating systems onto microcontrollers requiring high levels of safety (up to ISO26262 ASIL D). Multiple vendor independent OS/stacks can also run on a single microcontroller. COQOS Micro SDK provides secure, safe and fast context switching ahead of today’s software-only solutions in traditional microcontrollers. 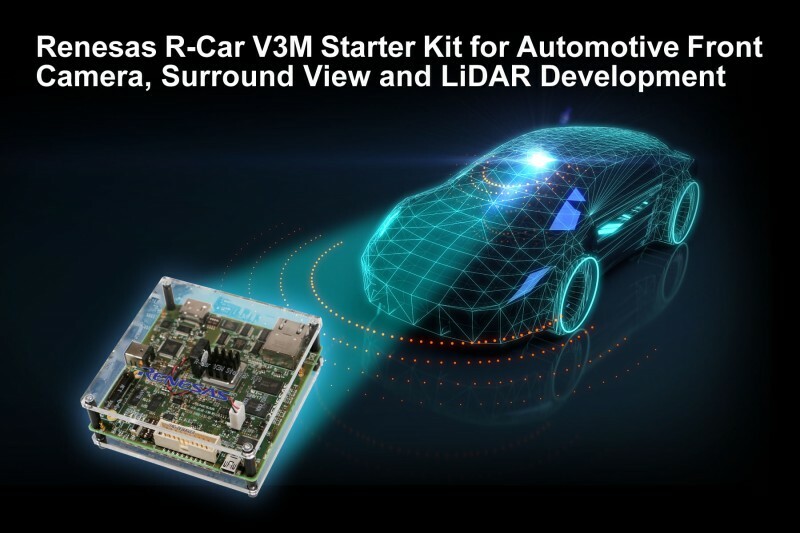 Renesas Electronics has announced the R-Car V3M Starter Kit to simplify and speed up the development of New Car Assessment Program (NCAP) front camera applications, surround view system, and LiDARs. The new starter kit is based on the R-Car V3M image recognition system-on-chip (SoC), delivering a combination of low power consumption and high performance for the growing NCAP front camera market. By combining the R-Car V3M starter kit with supporting software and tools, system developers can easily develop front camera applications, contributing to reduced development efforts and faster time-to-market. Renesas also announced an enhancement to the R-Car V3M by integrating a new, highly power-efficient hardware accelerator for high-performance convolutional neural networks (CNNs), which enables features such as road detection or object classification that are increasingly used in automotive applications. The R-Car V3M’s innovative hardware accelerator enables CNNs to execute at ultra-low power consumption levels that cannot be reached when CNNs are running on CPUs or GPUs. The new R-Car V3M Starter Kit, the R-Car V3M SoC, and supporting software and tools including Renesas’ open-source e² studio IDE integrated development environment (IDE), are part of Renesas’ open, innovative, and trusted Renesas autonomy Platform for ADAS and automated driving that delivers total end-to-end solutions scaling from cloud to sensing and vehicle control. The new starter kit is a ready-to-use kit. In addition to the required interface and tools, the kit provides essential components for ADAS and automated driving development, including 2GB RAM, 4GB eMMC (embedded multi-media controller) onboard memory, Ethernet, display outputs, and interfaces for debugging. The integrated 440-pin expansion port gives full freedom for system manufacturers to develop application-specific expansion boards for a wide range of computing applications, from a simple advanced computer vision development environment to prototyping of multi-camera systems for applications such as surround view. This board flexibility reduces the time needed for hardware development in addition to maintaining a high degree of software portability and reusability. The R-Car V3M Starter Kit is supported by a Linux Board Support Package (BSP), which is available through elinux.org. Further commercial operating systems will be made available from next year onwards. Codeplay will enable OpenCL and SYCL on the starter kit in Q1 2018. Further tools, sample code and application notes for computer vision and image processing will be provided throughout 2018. Renesas enables several tools on the R-Car V3M Starter Kit including Renesas e² studio toolchain and tools for debugging, which ease the development burden and enable faster time-to-market. In addition to the R-Car V3M Starter Kit, Renesas has enabled ultra-low power consumption for CNNs, which achieve image recognition and image classification, on the R-Car V3M SoC. The R-Car V3M allows the implementation of high-performance, low power consumption CNN networks in NCAP cameras that cannot be realized with traditional high power consuming CPU or GPU architectures. Renesas complements the IMP-X5, a subsystem for computer vision processing that is composed of an image processor and the programmable CV engine, with a new, innovative CNN hardware accelerator developed in house, that allows the implementation of high-performance CNNs at ultra-low low power. With this new IP, Renesas enables system developers to choose between the IMP-X5 or the new hardware accelerator to deploy CNNs. This heterogeneous approach allows system developers to choose the most efficient architecture, depending on required programming flexibility, performance and power consumption. The Renesas R-Car V3M is available now. The R-Car V3M Starter Kit with a Linux BSP will be available in Q1 2018 initially in limited quantities. A complete offering with an extended software solution is scheduled for Q3 2018. 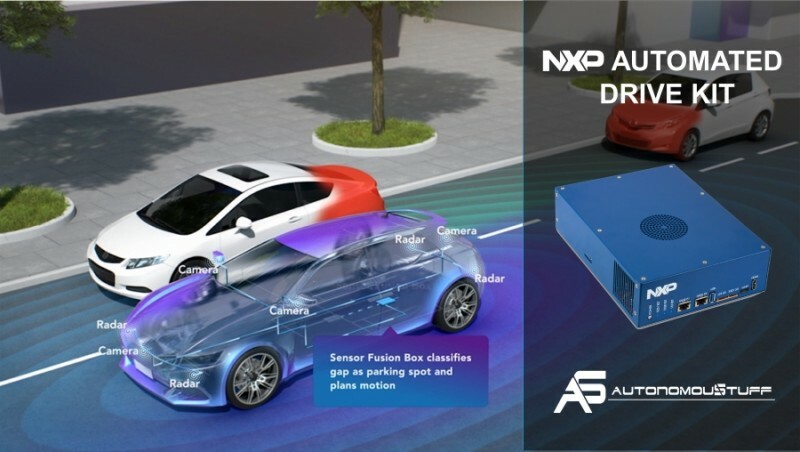 NXP Semiconductors has announced the availability of the NXP Automated Drive Kit, a software enabled platform for the development and testing of automated vehicle applications. The kit enables carmakers and suppliers to develop, test and deploy autonomous algorithms and applications quickly on an open and flexible platform with an expanding ecosystem of partners. 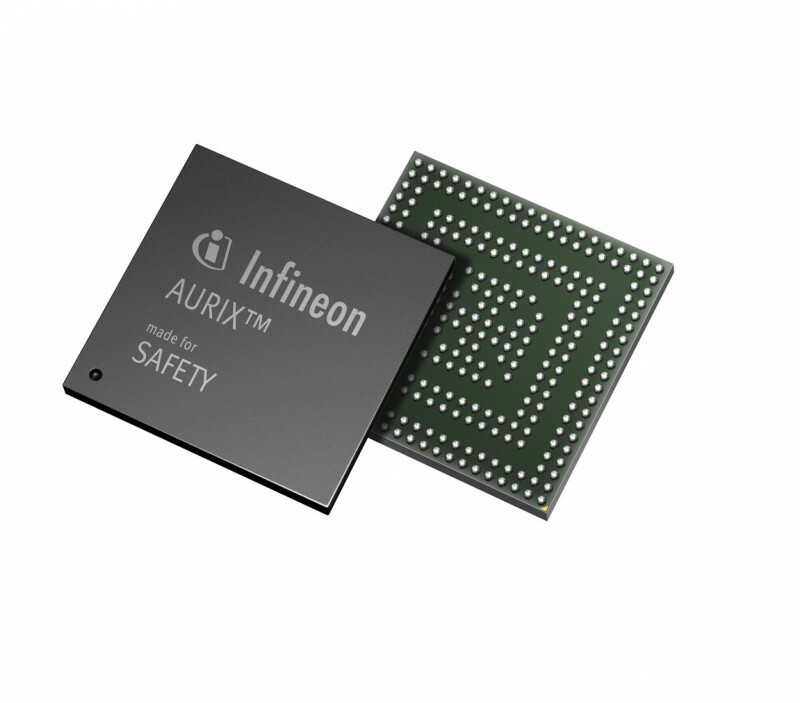 Infineon Technologies has announced that it supplies key components for the Audi A8, the first series production car featuring level 3 automated driving. The ability of cars to self-drive is split into a number of different levels: With level 3, drivers can temporarily take their hands off the steering wheel under certain conditions. The Audi A8 allows this when parking and exiting, in slow-moving traffic or in traffic congestion. Using microelectronics from Infineon Technologies, a car can take over in this kind of driving situation. Various types of chips from Infineon serve the safe automated driving in the Audi A8: sensors, microcontrollers and power semiconductors. Radar sensor chips from the RASIC family are installed in the front and corner radar. They send and receive high-frequency 77-GHz signals and forward these on to the central driver assistance controller (zFAS). A microcontroller from the AURIX family is a key component of the zFAS for reliable automated driving. AURIX enables to secure the connection to the vehicle data bus. It assesses and prioritizes data packets and initiates their processing in the fastest possible time. For example, it initiates emergency braking based on data from radar and other sensor systems. The AURIX family of microcontrollers is especially ideal for this purpose thanks to high processing power and extensive safety features. AURIX microcontrollers are used in several controllers in the Audi A8: On the one hand, they control the functions for the engine. On the other, they operate in the Audi AI active chassis and in the electronic chassis platform, which controls the shock absorption. The microcontrollers also support activation of the airbag. In addition to the electronics for drive, driver assistance and chassis, other semiconductor solutions from Infineon are installed in the comfort and body electronics, such as for example LED drivers from the LITIX Basic family in the tail lights as well as bridge drivers from the Embedded Power family in the windscreen wipers.